Switches are tested up to 200000 ON-OFF operations in a continuous cycle. The contact material is Copper with a layer of Silver Cadmium Oxide (AgCdO) which is a highly conductive material for electricity. High quality glass filled material [Valox Resin] is used in socket base to prevent from flames. The sockets undergo a heat resistance and flame test (Glow wire test) at 850°C and pass the test by letting off, just heat fumes. Valox Resin is flame-retardant and ensures low smoke. Poly-carbonate Resin, Lexan makes a highly insulated material with high Di-electric Strength is used. Toughening increases tensile strength, thermal shock resistance and safety of normal glass. It also increases its heat-withstanding capacity. Toughened glass is preferred in applications where strength, safety and thermal resistance are significant. In case of an accidental damage, the glass would shatter into fragments within the frame as in the glass of dashboard. 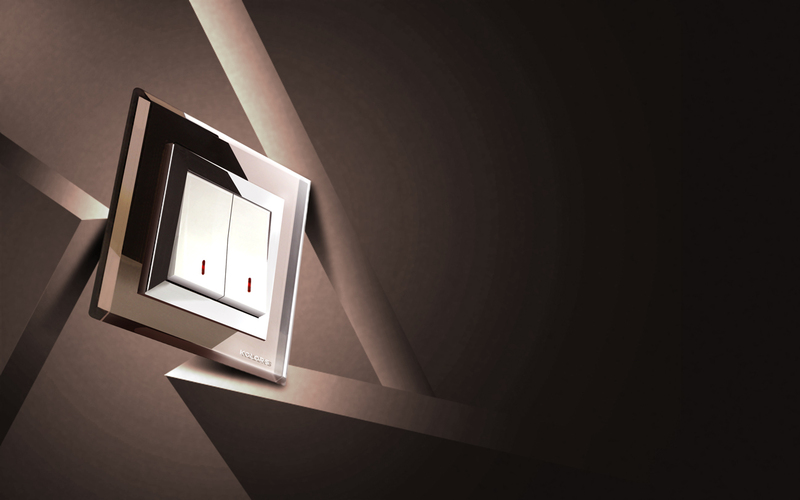 inner-frame is engineered to be extremely user-friendly to install or remove the switch. It will completely change the experience of installation of a switch. modern look, come with a 20-year warranty and a soft operational sound. Improved Chrome coating process ensures a brighter and more long-lasting product.